Professional color for less than lasers: Look professional with every page, using Original HP pigment inks for vibrant, durable prints that last. 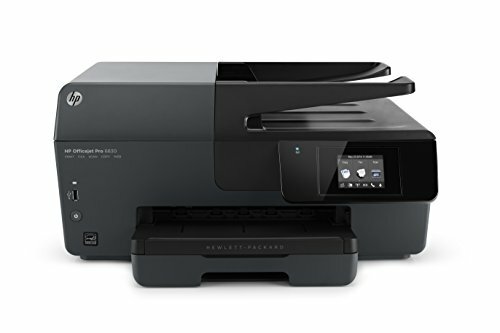 HP Instant Ink replacement service offers an additional low cost option to save up to 50% on ink. Set the pace for success with fast printing speeds—up to 18 ppm black-and-white and 10 ppm color. Print on your terms: Print wirelessly from your mobile device—no router or access to local network required. Print documents, photos, and more when you're on the go—from virtually anywhere—using HP ePrint. Easily connect to your local network and the Internet, wirelessly or using the 10/100 Ethernet port. Make every minute work for you: Easily manage all your tasks and access apps—just tap and swipe the 2.65-inch (6.75 cm) touchscreen. Free up time and quickly copy, scan, and fax multipage documents with the 35-page Automatic Document Feeder. Turn up the print volume. Reload paper less and handle large print jobs, using the 225-sheet paper tray.